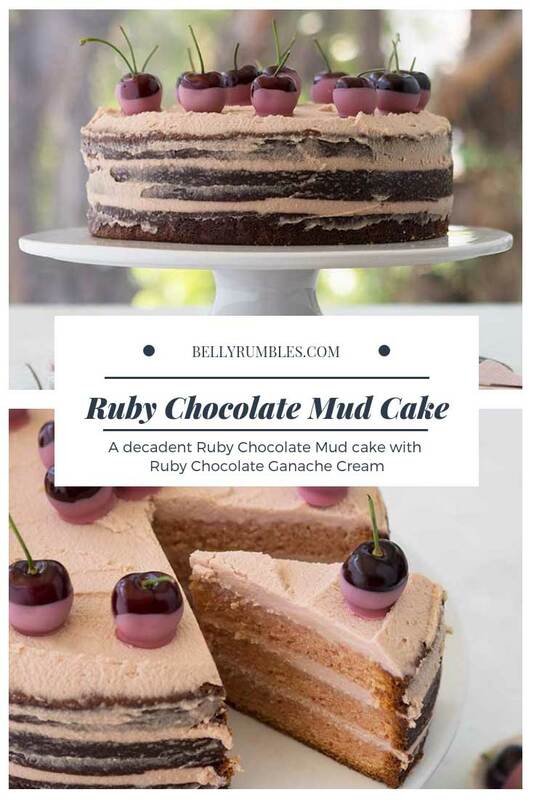 Ruby Chocolate Mud Cake takes on the fruity taste qualities of ruby chocolate. 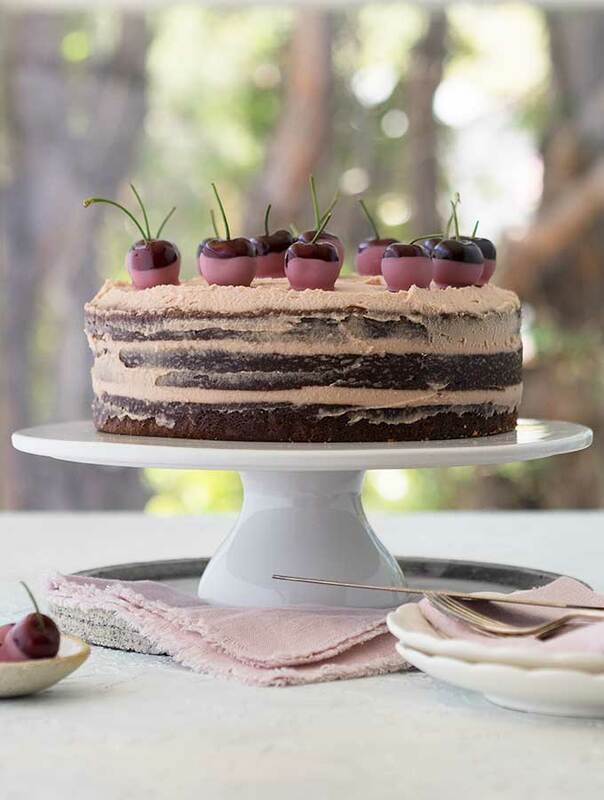 A dense and decadent mud cake with whipped ruby chocolate ganache and ruby chocolate cherries. 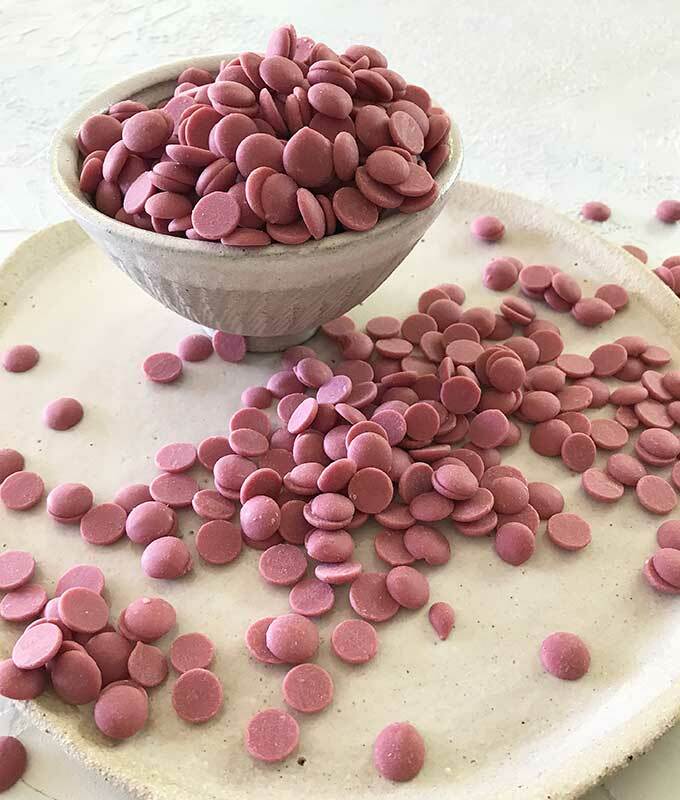 I recently wrote a guide to ruby chocolate, which covers most things that you need to know about this new type of chocolate. You can find it here, and I suggest you head over and give it a read for more in depth information about ruby chocolate. Ruby chocolate is a new chocolate which has been developed by Barry Callebaut. It is the fourth chocolate available, alongside white, milk and dark. It is the first new chocolate to be released in 80 years. The chocolate has a rosey pink colour to it. Not to be mistaken for pink coloured white chocolate. It also has a rather fruity flavour with a sneaky tart kick. It tastes like no other chocolate available on the market. Plus, it’s pretty!!!! One of the lesser known facts about ruby chocolate, is that it will discolour when mixed with liquids. This includes being added to a cake batter. The chocolate will turn a greyish pink. There are ways to overcome this. Some pink food colouring added to the batter or some beetroot powder. To show you what ruby chocolate looks like when it hasn’t had colouring added to it, I decided not to. Mainly as most photos of ruby chocolate dishes circulating at present are chef creations. To highlight the ruby chocolate aspect for their customers, you can bet that most of them add colour. I haven’t added extra colour to my photos either via photoshop. No tweaking except some light balance. I wanted you to see for yourself what it will look like when you make it at home. Now, I’m not saying it isn’t a pretty cake, but it isn’t as pink as you may expect it to be. Please feel free to add extra colour if you wish to your ruby chocolate mud cake. If you look at the ruby chocolate dipped cherries compared to the cake, it is obvious the colour change. The ruby chocolate mud cake is based on my favourite white chocolate mud cake recipe. Which funnily I am yet to share with you. I will share it soon I promise. It is a dense rich cake which forms a dense crumb making it perfect to decorate. The ruby chocolate mud cake is straight forward. Make sure your oven isn’t too hot or it will rise in the middle more than the edges. Don’t panic if it does, you can trim the top off with a knife. The whipped ruby chocolate ganache is the item of this recipe to watch. You don’t want to end up with ruby chocolate butter. When whipping the cream to add your ganache DO NOT over whip it, only whip until it is thickened and soft peaks (if any peaks). You will need to continue to whip in the ganache. This is where if you over whip sweet ruby butter will appear, or at least the cream will start to split. Make sure the ganache is cooled, not cold. Room temperature or a little over is ideal. No special equipment is needed for this recipe. Ruby chocolate is a new chocolate on the market, see my ruby chocolate guide for more details, and where to purchase. It is available in Australia and some other countries but is still being rolled out worldwide. The ruby chocolate mud cake should be stored covered in the fridge. Pre-heat oven 170°C/150°F fan forced (338°F/302°F fan forced). Butter and line a 23cm (9”) round, deep, cake tin. Place chocolate, butter, sugar and milk in a large heavy based saucepan. Stir over a low heat until all the ingredients have melted and combined. Take chocolate mixture off the heat and pour into a large bowl. Leave to cool until lukewarm (around 15-20 minutes). Once chocolate mixture has cooled, whisk in eggs. Then whisk through flour and baking powder. Pour cake mixture into the prepared cake tin. Place in oven and bake for 1 hour 45 minutes, or until cooked through. It is cooked when an inserted skewer comes out of the cake clean. Turn cake out onto a wire rack and leave to cool completely. Once the cake has completely cooled, trim top of cake to make it flat and even. Then cut the cake into three even layers. 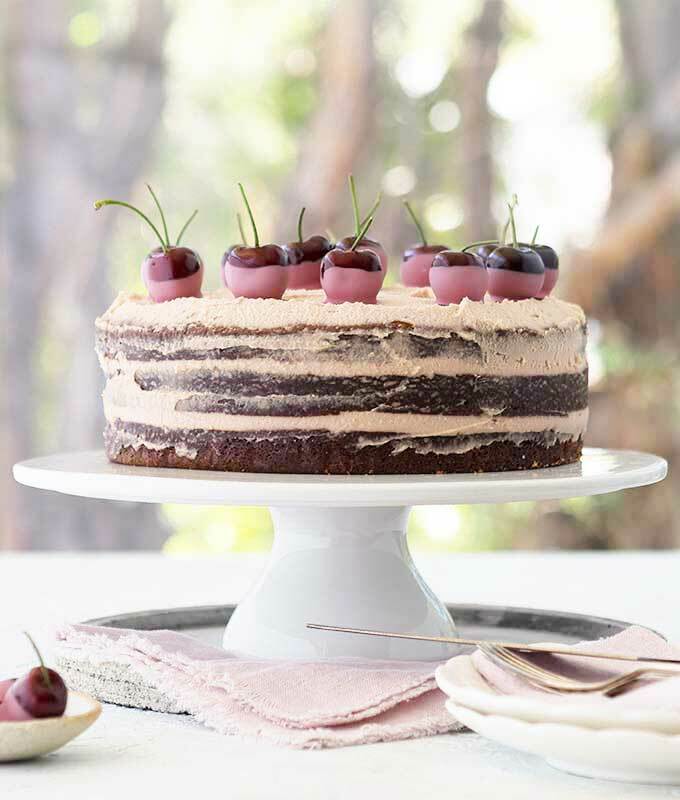 Place the bottom layer of the mud cake on a suitably sized cake board or serving plate/cake stand. If using a cake stand, please note that this cake must be kept in the fridge. Place 1/3 of the whipped ruby chocolate ganache on top of the bottom layer. Spread the ganache out evenly right to the edges with an offset spatula or spoon. Place the middle layer of the cake on top of the ganache, and then add 1/3 of the ganache on top of the middle layer. Spread out evenly as with the bottom layer. Place top layer on top of the ganached middle layer and place remaining ganache on top of the cake. Smooth out evenly covering the top of the cake. Smooth the ganache around the that is visible between the cake layers to create the naked cake look. 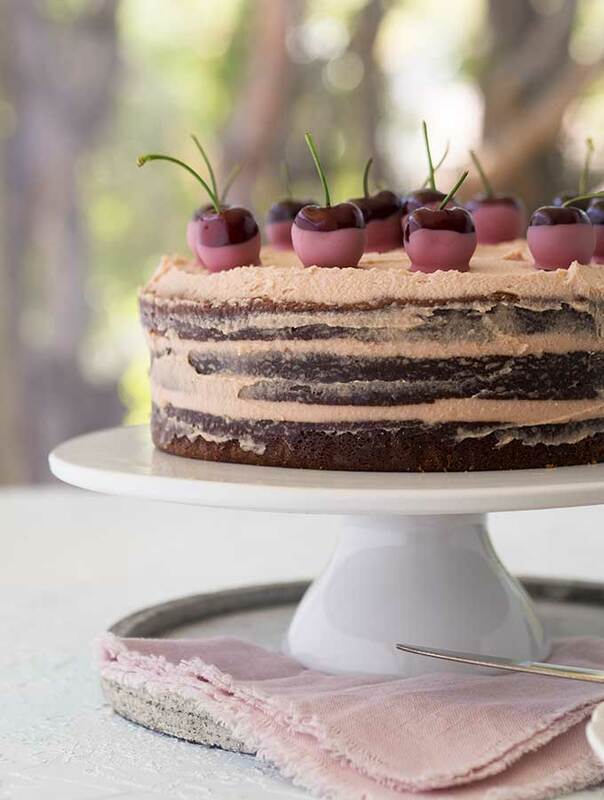 Place ruby chocolate cherries around the top of the cake for decoration. While the cake is cooling make the ruby chocolate cherries. 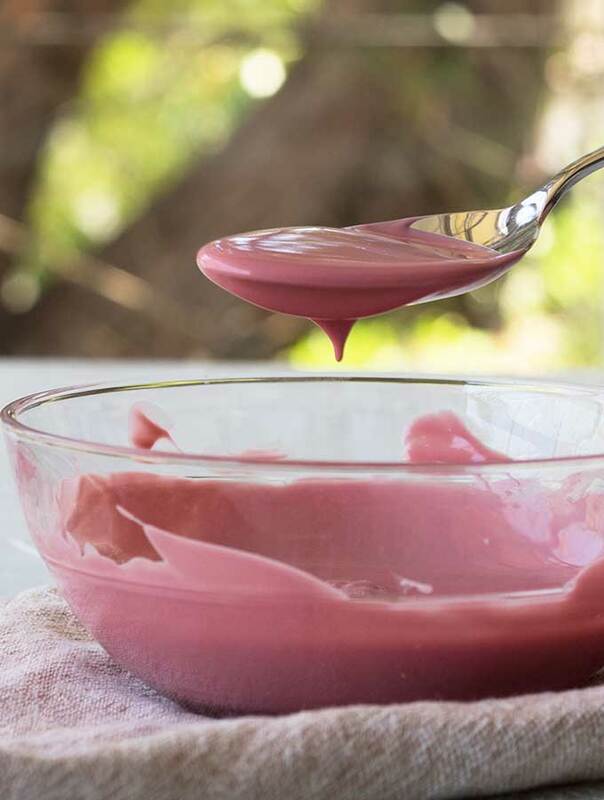 Simply melt the ruby chocolate in a small bowl. Once melted dip cherries in chocolate and place on baking paper on tray. 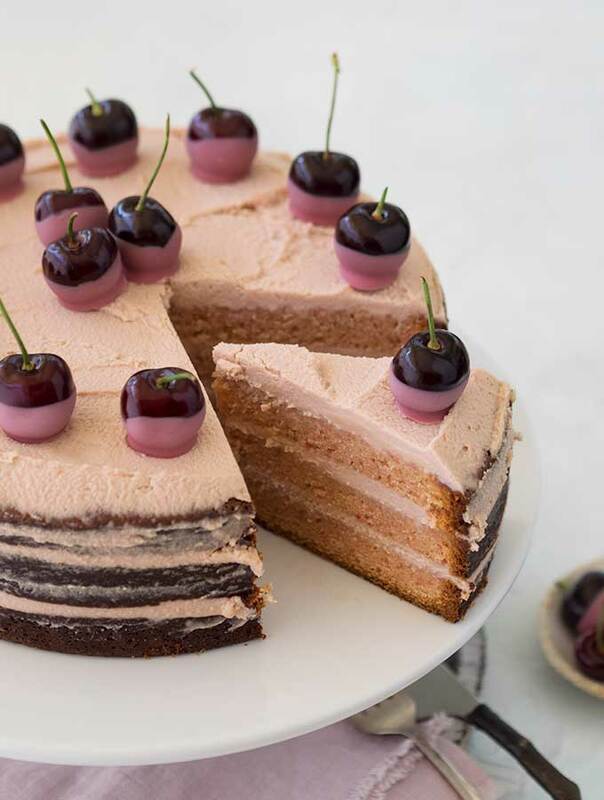 Place cherries in the fridge to set and until needed to decorate the cake. Place half (300ml) of the cream in a saucepan over a high heat and bring to the boil. Add the ruby chocolate and stir until the chocolate has melted and the mixture is smooth. In the bowl of a stand mixer place remaining cream (300ml). Whisk until soft peaks form. Add the chilled chocolate mixture to the cream and whisky until thick and combined. Be careful to not over mix or you will end up with ruby chocolate butter. I was all set to finalise payment to RedSpoon company for ruby and gold caramel callets when I read your article earlier this month on ruby chocolate, so thought twice about it but now after seeing this cake I want that chocolate, this cake looks so good. Have you any recipes for the caramel callets? Oh my goodness Carol, I really don’t want to put people off ruby chocolate. It is worth trying and also knowing going in that it is different to the other chocolate varieties. Glad you like the look of the ruby chocolate mud cake. I haven’t got any recipes on belly rumbles using gold caramel callets. I do have some in my pantry and have been using them for chocolate chip cookies!